Nathan Sharp coauthored “Inside the ‘Black Box’ of Sell-Side Financial Analysts” with Lawrence Brown, Andrew Call, and our very own Department Chair, Michael Clement. The FARS (AAA) recently selected that paper as the best financial accounting paper published in the last five years. Nate sat down and chatted with us about life post-Texas McCombs, working at Texas A&M, researching with Michael Clement, and much more. 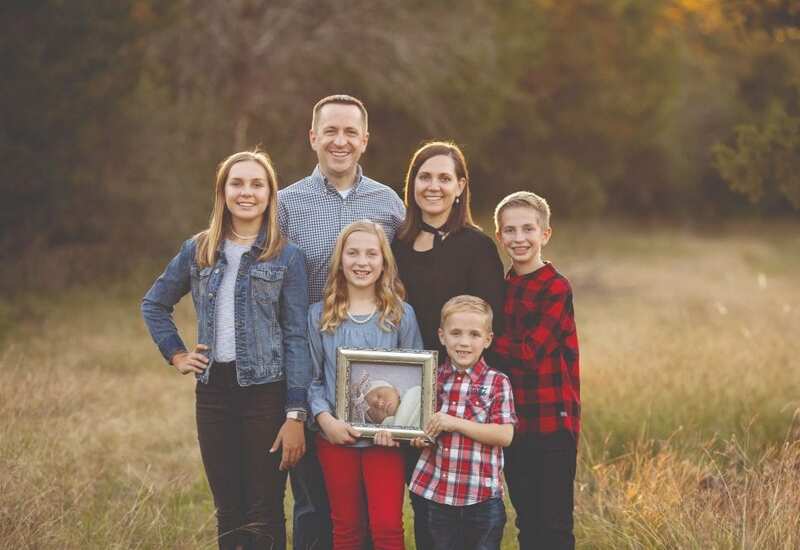 He is pictured below with his wife (Holly), daughters (Kennedy, London, and Kate), and sons (Jackson and Austin) in the fall of 2018. I spent much of the early part of my life in Utah, but I got to Texas as fast as I could. Next summer will mark 17 years since I moved to Texas. My wife and I have five children, and my family is the center of my world. After I finished my PhD at UT, I started my career as a faculty member in the Mays Business School at Texas A&M University. Coming to Texas A&M was one of the best decisions of my life. My family and I have been so happy to stay in Texas, and I have been blessed with great colleagues and great students at Texas A&M. HOW DID THE UT DOCTORAL PROGRAM SHAPE YOU TO BE THE PROFESSOR YOU ARE TODAY? I have thought often of the tremendous debt of gratitude I owe to the faculty at UT-Austin. I was so fortunate to begin my journey into accounting academia at a place where I could be taught and mentored by many of the top scholars in our field. UT’s accounting faculty has a depth and breadth that is unmatched by any other program I know of. The foundations of my career were laid in the PhD program at Texas McCombs, and any successes I’ve had in my career since then trace back to the way UT’s PhD program shaped me. CAN YOU TELL US MORE ABOUT YOUR RESEARCH PAPER “INSIDE THE ‘BLACK BOX’ OF SELL-SIDE FINANCIAL ANALYSTS”? In many ways, this was a ground-breaking paper in the analyst literature. We were the first scholars to survey sell-side financial analysts to gain detailed insights into the inputs and incentives that influence their research. Using a survey allowed us to ask questions that no other research paper had asked before. Our team of researchers complemented each other very well, and we had a lot of fun working together on this paper and seeing our idea come to fruition. In 2016, 0ur paper became the most highly cited paper in the Journal of Accounting Research among all papers published in that journal during the preceding eight years. One of our coauthors had a relative who worked in finance at a Fortune 100 company, and I still remember the day he reached out to share that the CFO of his company had discovered our paper on SSRN and shared it with the entire finance team at the company. It was neat to see that our paper was making an impact not only within but also outside academia. Our study also received a lot of attention in the popular press; journalists at The Wall Street Journal, Fortune, CNBC, Yahoo! Finance, and The Economist wrote stories about our paper. YOU HAVE WORKED WITH MICHAEL CLEMENT ON OTHER PAPERS BESIDES THIS ONE — WHAT IS IT LIKE WORKING WITH HIM? Michael is the type of colleague and coauthor everyone wants to find. I think part of what makes Michael so unique is that he brings together incredible institutional knowledge and experience with one of the top scholarly backgrounds in the country in the areas in which he researches. That is a rare combination. We followed up our sell-side analyst study with research on buy-side analysts, which was published in 2016 in the Journal of Accounting and Economics. Our latest study on investor relations officers is forthcoming in 2019 in the Journal of Accounting and Economics. These three papers are a trilogy of studies that complement each other and provide unprecedented, rich detail about each of these important participants in our capital markets. Frankly, no other team could have completed these three papers without Michael. He brought so much to the table that was invaluable for these projects. I have never had more fun working on research, and I have never learned more than I did through the trilogy of papers we published together. Michael has been the mentor of a lifetime. I am enjoying researching and teaching more than ever. The awesome thing about this career is that there are always new challenges, new research ideas, and new frontiers. I hope to follow in Michael’s footsteps by making a positive impact on students and colleagues in our field for many years to come.